Item is a 35mm rangefinder camera. 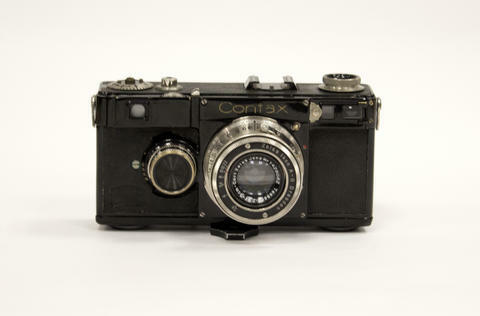 Zeiss Tessar introduced in 1932 as a top quality 35mm rangefinder system. The lens is a Carl Zeiss Jana 5cm f2.8 lens (# 1428082). Metal horizontal focal plane shutter for exposures from 1/5 to 1/1000 sec. One film cassette is included. The item shows some brassing and deterioration of the leather covering for the camera.